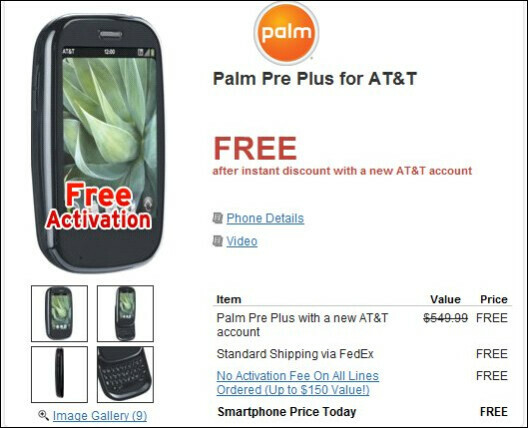 As if Wirefly wasn't already busy in making some of their smartphone offerings quite affordable, they're raising the ante over what Amazon was offering by making selling AT&T's Palm Pre Plus for free. Not only does the saving end there, but Wirefly is also waiving the customary activation fee upon signing a new contract with the carrier. Easily beating out AT&T's own price tag of $149.99 on contract, Wirefly surely makes it easy for just about anyone to experience all the multi-tasking fun associated with webOS. Although it's nice and dandy that AT&T is throwing a free Touchstone charger when you purchase the device through them, you can't help think about the no out of pocket expense required in getting yourself situated with the device through Wirefly. Why is this so shocking?? WIREFLY always offers a btter deal on a phone than the carrier who sells it. BUT BEWARE - WIREFLY has extra restrictions including fees for changing plans/features and cancelling separate from AT&T. Read all of the fine print before purchasing phone and make sure after you purchase the phone that the new line (if you get a new line) is added to current account (if applicable). Well I guess the better question is...who really cares about Wirefly or Palm Pre Plus? Obviously not many consumers care about the latter.